Alabama’s military veterans are mostly over the age of 50. 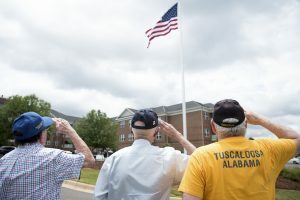 TUSCALOOSA, Ala. — The University of Alabama Office for Military Families and Veterans is partnering with AARP Alabama to assess the needs of the state’s older military veterans to develop and deliver outreach and educational interventions. The survey will focus on AARP members in Alabama that identify as having prior military service. AARP Alabama has more than 440,000 members, many of whom are older adults. Nationwide, approximately 4 million – nearly 10 percent – of AARP members have served in America’s military. Results are expected by the end of summer and will help AARP strengthen its ongoing efforts to connect military veterans to various resources and services. AARP expects to share the report later this fall and with partners serving veterans and military families. AARP also provides relevant news and programming about healthcare, finances and government benefits to the state’s veteran population. Dr. David L. Albright, Hill Crest Foundation Endowed Chair in Mental Health in UA’s School of Social Work and director of the Office for Military Families and Veterans, said the study focuses on behavioral health, caregiving, food insecurity, homelessness and other issues that may emerge. Candi Williams, director of AARP Alabama, said the state-focused veterans survey is the first of its kind for the non-profit organization, which has more than 38 million members nationwide. The data will potentially influence AARP’s ongoing work to support veterans nationwide. Williams said the disconnect between veterans and resources became increasingly evident in the AARP caregiving classes, where they continue to meet former military service members caring for their spouses or children, or loved ones caring for a military veteran. Issues facing older veterans go beyond topics that typically affect the entire age spectrum of former military service members, like new scams and frauds that directly target older veterans. “These data will help us build a plan of education, outreach, and advocacy to support our veterans, and is likely the pilot for a national effort,” she said. Albright previously completed a veterans needs assessment study in South Alabama and Marengo, Dallas and Wilcox Counties. And, he recently announced a partnership with Vettes 4 Vets and the United Way to assess veterans’ needs in Jefferson and Shelby Counties. The leadership of, and partnership with, AARP is exciting and vital for both the success of identifying the needs of older veterans and helping to translate those findings into meaningful action and potential policies at both the state and federal levels, Albright said.